کامیابی آبکوه, سلمان, اسکویی, بهروز. (1392). مدل‌سازی داده‌‌های مگنتوتلوریک با قطبش H به روش تفاضل متناهی. مجله ژئوفیزیک ایران, 7(2), 37-48. سلمان کامیابی آبکوه; بهروز اسکویی. "مدل‌سازی داده‌‌های مگنتوتلوریک با قطبش H به روش تفاضل متناهی". 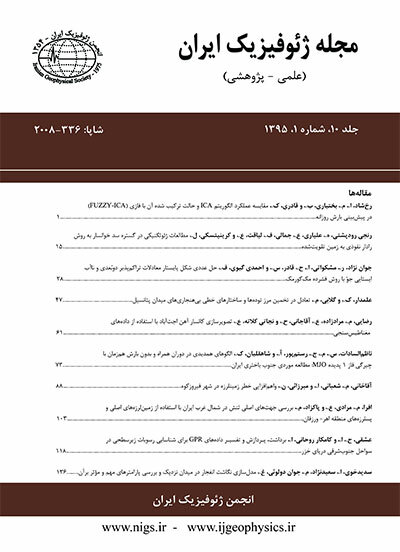 مجله ژئوفیزیک ایران, 7, 2, 1392, 37-48. کامیابی آبکوه, سلمان, اسکویی, بهروز. (1392). 'مدل‌سازی داده‌‌های مگنتوتلوریک با قطبش H به روش تفاضل متناهی', مجله ژئوفیزیک ایران, 7(2), pp. 37-48. کامیابی آبکوه, سلمان, اسکویی, بهروز. مدل‌سازی داده‌‌های مگنتوتلوریک با قطبش H به روش تفاضل متناهی. مجله ژئوفیزیک ایران, 1392; 7(2): 37-48. در تحقیقات ژئوفیزیکی مسئله‌‌ اساسی به‌دست آوردن مدلی است که بتواند به بهترین وجه ممکن ساختارهای زیرسطحی زمین را نشان دهد. گام اساسی برای این کار به‌دست آوردن کمیت‌های قابل مشاهده در سطح زمین به‌‌کمک قوانین فیزیکی است. این مسئله‌‌ با مدل‌سازی پیشرو عملی می‌‌‌شود. در این تحقیق مدل‌سازی پیشرو برای روش مگنتوتلوریک (زمین‌مغناط‌برقی) مورد بررسی قرار گرفته است. بدین‌‌منظور یک کُد در محیط نرم‌افزار متلب نوشته شده است. روش عددی استفاده شده برای حل مسئله‌‌ مدل‌سازی، روش تفاضل متناهی است. در این تحقیق مدل‌سازی پیشرو مگنتوتلوریک با مُد TM مورد بررسی قرار گرفته است. این کُد قادر به مدل‌سازی پیشرو داده‌‌های مگنتوتلوریک برای انواع مدل‌های مصنوعی دوبُعدی است. هر سه مدل و پاسخ آنها آورده شده است. دیده‌می‌شود که کد به خوبی مدل‌سازی مدل‌های مختلف را انجام می‎دهد. The basic point in geophysical studies is to obtain a model that can show structures below the ground surface. The basic step for this project is to obtain measurable parameters at the surface of the earth by physical laws. This object can be done by forward modeling. In geophysical investigations, the simplest model representing the earth is a one dimensional model which in the conductivity varies just with the variation of depth. In more realistic models of the earth, resistivity varies not only with depth, but also with one horizontal direction. Two dimensional forward modeling can be solved by analytical methods for some special cases. In two or three dimensional general cases, modeling performs by numerical methods. The numerical method in this case is the finite difference. When the results are extensive, this method is more useful, in comparison with the other calculative computer methods. Finite difference method does need much volume of CPU; also this method is suitable for running on some computers simultaneously because only the nearest adjacent points involve calculations. The main point in this method is the space size of the model blocks and the number of required frequencies. This will determine the duration of running time of the code. Solving the problem of electromagnetic induction in the earth by numerical methods has been considered by many earth scientists for years. Various methods and techniques have been used in this field such as transmission line analogy, integral equation, finite element and finite difference. (Brewitt-Taylor and weaver,1976.) Jones and Pascoe are one of the first persons who have worked in this field. Jones and Pascoe’s articles in 1971 and 1972 further more than theoretical solution of electromagnetic induction, also included FORTRAN codes of electromagnetic induction solution by finite difference method for two dimensional structures in a layered earth. Nowadays researches in this field are focused on solution of electromagnetic induction in three dimensions. An economical and good formulation of this point in Integral vector equation method is presented by Raiche in 1974 and also the same method in more details is presented by Weidelt in 1975 separately. Maxwell equations are needed for forward modeling of magnetotelluric data. The main equations which have been used in this research are curly differential Maxwell equations of electric and magnetic fields and the finite difference method is used for these equations. After setting the preconditions for having softer variations in electrical resistivity, a model for electrical resistivity has been gained in node points. By determination of final formulas of finite difference for all of the blocks of the net, the code for forward modeling in MATLAB is written. MATLAB code after obtaining the values of electric and magnetic fields for all points of the net, determines the electrical resistivity and phase of the points. Eight matrices are the initial data for MATLAB code. These matrices introduce the model parameters. After making the model, MATLAB code makes the matrices of the system equations coefficients for obtaining the electric and magnetic fields values of the net. In conclusion, by calculating the electromagnetic field values, the values of the electrical resistivity and phase are gained for all points. In this study, a forward modeling of TM mode magnetotelluric data is used. The MATLAB code is able to forward model the magnetotelluric data for various artificial two-dimensional models. Three models and their responses are presented. The code performs the forward modeling of various models perfectly. Jones, F. W., and Pascoe, L. J.,1971. A general computer program to determine the perturbation of alternating electric currents in a two-dimensional model of a region of uniform conductivity with an embedded in homogeneity: Geophys. J. R. Astr. Soc., 20, 317- 334. Berdichevsky, M. N., and Dmitriev, V. I., 2008, Models and Methods of Magnetotellurics, Springer- Verlag Berlin Heidelberg. Nabighian, M. N., (Ed), 1991, Electromagnetic Methods in Applied Geophysics Applications/ Parts A and B, Society of Exploration Geophysycists. Simpson, F., Bahr, K., 2005, Practical Magnetotellurics, Cambridge University Press.